Are you (or your child) attending a primary or secondary school in the Netherlands? Is this school willing to organise or organising a fund raising activity? Or are you a teacher in a school and would you like to organise an activity for CooP-Africa? CooP-Africa would be glad to support to make the activity a success! In recent years we have cooperated with schools such as ‘Stedelijk Gymnasium Nijmegen’, Driemark in Winterswijk, Citadel College in Lent, Marang in Angeren and the Zilverzwaan in Huissen. 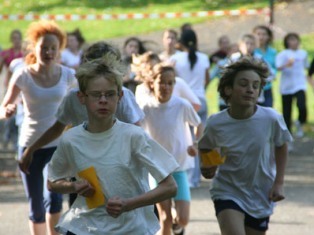 These schools organised sponsor runs, auctions and charity markets. All kinds of activities and ideas are possible! Organise your activity for bicycles for students in Africa, the Bike4School programme of CooP-Africa. If your school decides to organise a sponsor activity we can send you brochures and flyers, which you can share with teachters, students, parents, (local) companies and organisations in the neighbourhood. CooP-Africa can support in writing a press release. Send it to the (local) press and jump at the chance to generate publicity for your fund raising action to support students in Africa with bicycles. Share your plans with us and we can discuss how we can help you to make your activity a success. Send an email to info@coop-africa.org or fill out the form below. Looking forward to hearing from you soon! No Comments to "Sponsor activity school"